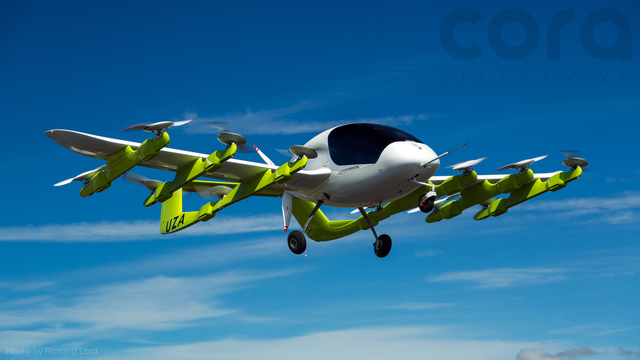 The important element of the Cora design is that it's a hybrid of multirotor helicopter ("drone") and traditional fixed wing flight. The multirotor approach allows highly controlled vertical takeoff and landing, but it uses a lot of energy. The fixed-wing approach can be much more efficient, and quiet. When it comes to electric aircraft, efficiency is not just a green ideal, it is essential to give them usable range and duty cycles. They are going to start in New Zealand, having found a nice low density country with an amenable government. They have released few specs on the vehicle, other than saying it has a 110mph top speed and a range of about 62 miles on its batteries. That's almost 4 times more than the 27km claimed for the Volocopter, an all-multirotor from Germany which has done test flights there and in Dubai. It does not match the range of hybrid fuel vehicles which burn liquid fuel to run a generator that powers the electric aircraft. Cora is planned only to be an autonomous taxi, it will not be for sale. This is the right plan for a well funded company. With a 32 foot wingspan, Cora is probably not landing on the driveways of the middle class. It's more for parking lots, flat rooftops and other fairly open areas. Even with the advanced control of an autonomous system, you are not going to want to land it among trees and power lines in the wind. It is also uncertain how much noise it will make when landing. Electric planes are much less noisy than a traditional helicopter, but still on the noisy side. It also does not fly very high, with a ceiling of 3,000 feet, but that should be enough to keep noise down. There are still a lot of places the Cora could land, and that offers the ability to use a combination of robotaxi (or even human driven taxi like Uber/Lyft) to your nearest flying vehicle, with the same smooth transfer on the landing. Urban trip times would easily be cut by a factor of 2 or 3 in places with good highways, many more factors in places like São Paulo where it can take hours to go a few miles. A 100 mile range, while good, does mean it needs some method of frequent recharge if it's to work as a taxi. Fast recharge of 50kw or more, like the DC fast chargers of electric cars. These are not yet plentiful. Fortunately, a vehicle would never use its full range. After dropping off its passenger, it will take a short flight to the nearest landing spot that has power, and there either human beings or robots would plug it in, or possibly battery swap it. (Inductive charging seems unlikely for a vehicle of this shape.) The vehicles will probably live at these charging spots when not on a job. The photo shows a regular rear drive propeller for use during the fixed wing flight. The smaller rotors shut down after takeoff for efficiency, though they may be useful for some elements of control. They are tilted at an angle; it is unclear if they can be angled or this is their fixed orientation. They are equipping the vehicle with a parachute, but normally a vehicle with this many rotors and redundant batteries should be able to handle the loss of several of the rotor/motor units and still land under power. How long until my flying car? There are still a lot of hurdles before you can ride, but prototypes like this and the others should remove doubt on the physical possibility of the technology. Social issues including noise, airspace and public confidence still have some ways to go. The size of the battery is not named, but it suggests an energy efficiency better than most gasoline cars and a little worse than electric cars. One interesting question will be the elitism of such vehicles. Once they work, the price will need to be high because they will be super good. Who would not want to fly above traffic on any trip of more than about 20 minutes? Since everybody can't, it will be perceived that the elite get to literally be "above the hoi polloi" on the ground. The price may be high because of demand, but my initial analysis of economics suggests the vehicles can sell rides for less than the cost of an Uber on the ground today (with human driver) which is about $1.50 per mile. More to come on that. In other articles I have touched on the other issues, and we'll see more in the future. Such vehicles open up all sorts of locations to use by large numbers of people, and so will mean big changes to real estate. Living on a hilltop or other inaccessible place becomes totally practical. The great natural places become open to all regardless of physical ability; you will be able to get in 20 minutes to places that take 4 days of brutal hiking. Police and emergency services will make heavy use of vehicles like this. Speculation below suggests the pole on the front is a pitot tube for measuring airspeeds during the test phase. I expect flying cars to follow the same adoption curve as ground cars did. Rich people's toys at first, then as volumes increase and costs fall, they come into reach for everybody. I also expect to see all surface roads become two-lane, heavy cargo only routes, while people normally travel point-to-point in the air. As noted, Kitty Hawk plans the "Uber" model for these. This means slightly less of a "toy for the rich." A flight will not be inherently that expensive. The price will be high at first simply because everybody is going to want to fly and there won't be enough of them to meet demand, and later, until airspace allocation problems are solved, there may not be enough airspace for them. But if they cost $250,000 and, with the aid of battery swap, can do 20 flights a day and last 4 years, that's only $9/flight in depreciation. The electricity will be at most $2/flight. The infrastructure for charging and landing are hard to price but not that much more. So think about that. An Uber to SF from Silicon Valley is $70 and lots of people do that now. This thing will do it in 1/3rd the time and might reasonably be priced less than that. The price will be marked up because of high demand. But that still means that the non-rich can use it when their trip is urgent. If you're in a hurry, you'll pay the premium, even if you're not rich. The main issue will be all those rich people who just pay it because why not? The probe on the nose is probably a pitot tube. Projecting out from the nose is the easiest way to get it into clean air undisturbed by the rest of the aircraft, and the shortest plumbing into the control system. Although it would seem to be a significant hazard for unsupervised passengers moving about the outside of the aircraft (as all those rotors would be, "Don't hang your bag on that!"). Perhaps it is retractable? The long pitot is common on experimental aircraft. You could move or shorten it after you had a better model of airflows around the plane. It will be a pitot tube, but the reason for the length is that it will have an angle of attack vane mouned on it, necessary during flight testing to establish aerodynamic characteristics of the aircraft. How can we get these things? https://www.youtube.com/watch?v=kDay5OWDPn4 They came out of a contractor in San Diego doing the obvious things to scale up drones, and then the Navy classified the heck out of them. As if anyone can't think of the idea themselves. That vehicle can drive on its wheels (more of a real flying car) but it only flies as a multirotor, meaning it needs a lot more energy than the fixed wing Cora. That means a lot less range.